Problem starts when we try to measure current. If we take the fluke device, and put it in serial to the voltage of the pcb to measure current, what happens is that the MCU starts to get resets, and the WiFi module voltage is drops .nothing is works than. We have tried to change the current scale on the Amper-Meter , from 20m to 20A. Nothing helped. *if we measure current of other stuff that consumes lest current, it DOES measure and show the right current. The problem occurs only with the pcb that contains a WiFi module that takes 70-100mA. connections are: 3v3 from arduino - > Ampermeter plus->Ampermeter minus->board 3v3 . This is the "burden voltage" of an ammeter - when a 'shunt resistor' is used to measure the voltage drop due to current flow, then the voltage seen by the circuit being powered is lower. Multimeters, because of their wide sensing range, tend to have relatively high shunt resistors, which causes the circuit being powered to see significantly less voltage, and so some things don't work right. I'd recommend putting a very low value resistor in series with the 3.3V rail that's powering the wifi module (say, 100mohm), and then measure the voltage across that resistor & do the Ohm's Law calculation to work out the current. Dave Jones of EEVblog made a video about burden voltage (one of his first videos). The same Dave Jones also built an add-on for multimeters to cope with small currents measurements and high burden voltage: the μCurrent. Note: although he sells those devices on his site, it is Open-Source Hardware, so you may build your own. On his youtube channel or on his site you'll find additional videos on that device (both on its usage and on how he designed/built it). BTW, note the funny-looking way they usually specify the burden voltage: in that table above, for example, they say 1.8mV/mA instead of simply 1.8Ω or also 100μV/μA instead of 100Ω. 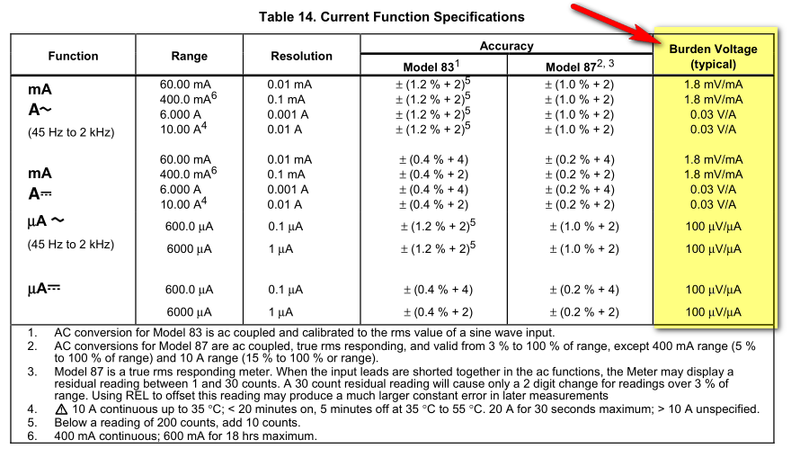 They want to underline that for each mA your load draws the multimeter causes an additional 1.8mV voltage drop. Moreover, see how the burden voltage increases on low-current ranges! That multimeter is an industrial multimeter, so it is not designed with low-voltage+low-current applications in mind (in industrial environments often low-current circuits are relatively high-voltage, so a 100mV/mA burden voltage is not a real concern). This is common also for cheap or middle-range multimeters usually, since measuring very low currents with a current shunt and low burden voltage means that the amplifiers in the multimeter must be able to cope with voltages in the 1mV range or less. This requires precision, low-drift, low-noise amplifiers and accurate design of input stages, which adds to the overall cost of the multimeter. Not the answer you're looking for? Browse other questions tagged arduino voltage current-measurement or ask your own question. Can a multimeter measuring current damage low voltage devices? Voltage drops and current for LED? PCB Board drawing high current when little bit of liquid gets into it. How to debug the board? 30A Relay resets Atmega8A MCU as it engages. Are these PCB layouts to blame?